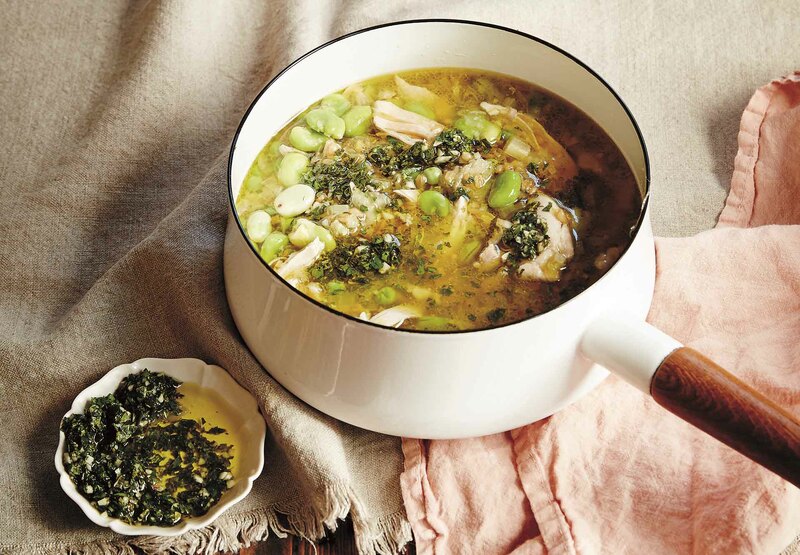 With its beautiful broad beans, peas and nutty wheat grain, this broth is a lovely way to celebrate spring. 1. For the herb oil, finely chop the garlic and herbs together on a board. Transfer to a small bowl, squeeze in the lemon juice and drizzle in enough olive oil to give the sauce a pourable consistency. Season with salt and set aside. 2. Cook the wheat in a saucepan of boiling water over a medium–high heat for 20–25 minutes or until al dente. Drain and set aside. 3. Meanwhile, heat the olive oil in a large saucepan over a low heat. 4. Add the leek, celery and a pinch of salt and gently fry for 7–8 minutes until soft and translucent. Add the garlic and cook for another 1–2 minutes. Pour in the chicken stock and bring to the boil. Reduce to a simmer and add the chicken thighs. Poach the chicken for about 12 minutes until just cooked, then remove and set aside until cool enough to handle. Shred the chicken into large pieces and set aside until ready to use. 5. Bring a saucepan of water to the boil. Add the broad beans, boil for a few minutes, then drain and set aside to cool. Peel off and discard the outer layer of the beans. 6. Add the wheat to the simmering broth and cook for 5 minutes so the wheat takes on some of the broth flavour. Return the chicken to the broth and add the peas and broad beans. Simmer for 2–3 minutes or until the peas and broad beans are just cooked. Season to taste then serve immediately, topped with spoonfuls of the herb oil. Recipes from Ostro: The Pleasure That Comes From Slowing Down and Cooking with Simple Ingredients by Julia Busuttil Nishimura, published by Plum, RRP $44.99. Is the best diet in your genes?